I've started playing Samurai over at MaBiweb.com. While I like the game (I think). It has the same problems that I have with contraction games, plus a few more. I don't read too much about this concept, so I might as well try an put my scholarly vest on define the next few things here. Most games, i believe, fall into either one of two categories, contraction or expansion. This describes the general flow or state of the game as it progresses. Samurai is a perfect example of a contraction game. It starts out with an empty board; you can put a tile damn near anywhere. Slowly, the board starts to become choked, you have limited placement opportunites, and even MORE limited good placement opportunities. Most abstract games work along this line to some level. On the other hand with expansion games, you start out with very little in the way of choices, and things slowly build as more, and frequently more powerful, choices open up. Puerto Rico seems to be a fine example of this, but many other themed games fall into this category, such as any civ-game, or train-route building game. A big draw to this, I think, is slowly getting all the cogs in your machine together, and watching them work. Typically, the games become more about how efficient a player is at collectiog and using his little parts of the whole. Expansion games, to some extent, are easier to grasp and teachbecause starting with nothing, you can explain each part as they come up. Contraction games seem harder to teach. And wrapping your head around good initial play because you need to understand the whole game at the start of the game to fully understand their impact. For some reason, a badly placed starting move here always comes to back to haunt you. That's not to say that a game can't have elements of both. Clearly, train games can start you off with a full map of empty goodness to go off and start laying tile to god knows where. But there is a certain amount of micromanaging that you bring to the table that helps you understand that your measly 5 grand isn't going to get you a track from NY to Los Angeles; maybe you should just build to Buffalo instead. And one could argue that Chess has a lot of expansion given the way I've defined the term: even though you are slowly eating away at your pieces, you are basically trying to build the most efficient world in which your little army guys protect each other while attacking the opponent. For a game that seems to be be all about maintaining balance, (and lord knows the tie-breaking deals with this a lot along with the correct game-ending conditions) why does it seem painfully obvious that your first few moves should be solely centered on racing to get control of the 3 token city (Oni)?? That's such a powerful area on the board, especially in two player games, the rest of the board feels clearly out-balanced. So in my first few games, I've ignored it all together letting my opponent spend all his effort on collecting those. And I should lost both games; the one game I won I attribute to the other player not knowing the correct end-game rules. I think that given a 3 or 4 player game, the "capture of Oni" issue is lessened somewhat by the implicit collusion of having more players. I hope. I've seen more than one game of Tikal on Spipelbyweb.com hand out a free victory by all the other players just leaving a single player alone to do their own little thing. So you can't trust the implicit collusion thing to work. Of course, having said all this, I still think it's a fujn little game, IF ONLY I WASN'T SO MAD ABOUT ONI BEING SUCH AN OBVIOUS CHOICE. At least I think. ...for this month's showdown are as follows. 1: This seems to be a case of the graphic actually making the game harder to understand than it is. My, that's an impressive looking org chart! This game probably needs a little more editing down for this contest as the rules are really caught up too much in the details. Entry #2: Stam, 5 points. Big points for giving the player the toys to actually play with, instead of just some spy-tech cards. Bravo. 3: Raid on OmniTech, 3 points: Probably the best entry in regards of trying to do " just enough" to fill the 800 word limit. 4: Do the individual spies really vote for their chairperson? Anyway nothing really jumped out at me, aside from the pretty world game board. 5: Not a big fan of future Spy theme. A lot of time is spent describing the world instead of explaining the game. 6: Sci-Fi Pulp Adventure, 1Point: While I am not a big fan of the way the combat is used, or the fact that I'm not even sure this meets the "players control one agent" requirement, I think that this style of game has merit. With a little bit of working out an playtesting, there could be something interesting. 7: This game just left me dry for some reason. Probably for those who demand theme in their games, this game would work better due to the generic-ness of the Secret cards, which seem to demand some amount of themeing. 8: Gaslight Agents, 1Point: The idea of cards sticking to a country from game to game is pretty interesting. I feel that this is a fairly good basic game here, otherwise, with easy to implement R-P-S balancing. 9: This game runs somewhat similar to game #6, but more Role-playing-style. However, the amount of math required to figure out the amount of dice to just roll REALLY puts me off. If I didn't like the way combat was used in game #6, I HATE combat in this entry. In general, a lot of what I feared from this challenge came to pass. Except that a lot more decided to do "AGENTS FROM THE FUTURE" than I would've guessed: i.e. tracking down killer robots. I am not planning on entering this month's BGDF challenge. I'm not really sure why. A lot of things I think are factoring into this choice. First of all, I've got too many plates spinning regarding my hobby time that I want to get finished. Another thing that seems to be stopping me is that usually within a day or so after the announcement of the contest, I have a clear vision of the game, or at least the gimmick that I want to exploit. In this challenge, I'm pretty much drawing a blank. Mostly, oddly enough, because of the theme. The basic theme is interesting enough. However, since it's pretty clear that the game needs to deal with HIGH TECH spies (or spies with COOL TOYS), that's another implied limitation not spelled out in the limitation list. And for some reason, I don't want to force that consideration into the rest of the limitations, which I think are fairly interesting in their own right. I guess, I could just simply add some HIGH TECH cards into the mix; but that wouldn't very interesting; I'd want to spend most of my 800 words trying to come up with an interesting way of dealing with high tech weapons. I think I'd need those words to do the solo/everyone limitations interestingly. Suddenly, the game begins to have to get watered down a lot to fit the pieces together. Hmmm, maybe that's the real reason why I'm not particularily interested in it this month. There's no limitation that lends itself to a rather interesting solution. Instead, I can easily see every entry being some variation of "all players control an evil lair whiile they all control an agent getting into the other player's lair." One of the main ways to win the showdown, I believe, is to try and create something very different from the rest of the games, and the one interesting approach I thought of would be something like everyone playing a spy going to some Spies R Us auction/flea market to purchase goofy spy-ish weaponry from various inventors, but clearly evil villians know this place exists, so they (the players in their dual roles) have cleverly hidden bombs and booby-trapped weapons throughout the flea market. But it's not something I thought was strong enough to pursue. Now I miss playing Before I Kill You, Mister Bond. Naturally, in the negative-opposite world that I live in, it's the theme that has seemed to inspire a lot of people to actually try this contest this time around. Constraints be damned, which is usually the thing that I find sort of interesting to play with. Who says a theme can't sell a game? However, I'll still go off and cast my vote. Hopefully, I'll be happily surprised by a few of the entries who can make something interesting and different enough to stand out. I'm a fairly big fan of the national parks out West. Of course, "West" needs to be capitilized because it is much more than a direction; it is a place to itself. I think. Anyway, I'm a sucker for watching all of the Travel Channel shows for those parks. Places like Zion/Bryce, Lake Powell (neither of which I've been to...yet) and Yellowstone (aka, The Park With the Most Varied Ways to Die). "Imagine being a pioneer on your way to California. And then you suddenly come to this spot, and look in awe at the beauty and vastness of nature that is the Grand Canyon. Imagine what those first travellers must've felt, the rush of excitement of seeing a place such as this..."
Sorry, if I'm a pioneer on the way out West and I suddenly come to the end of perch of the Grand Canyon, I think my first response is, "CRAP! How the hell are we going to get around THAT thing! Why is God punishing us!?? Now, who's horse are we going to eat tonight while we figure out our next move..."
As a side note, leaving Las Vegas the other day, I'm happy to report that McCarren Airport has e-ticket kiosks that work with every airline! SWEET! And Free WiFi. Well, at least I HOPE free WiFi, otherwise the person who is "guest@hotbodies.com" (the usual login I use when I don't want to be tracked down easily) is going to get billed for it. Generally, I'm not much for trying to create a specific "feel" of a world in a game. Even though it's fun to write that intalicized intro text, I tend to pretty much skip over it when reading other people's rulesets. I think this is primarily because there are so few new themes to explore. "Yeah, it's a fantasy world. I get it, I don't need a long explanation of what that's like." Of course, not that this hasn't stopped me before. But my concept for Dark Sky Salvage is a little unusual. The quick description of the game is "shipwrecks in hyperspace." I've had this concept for a story for a while. So this let's me type out the concept for TWO reasons, storyline and game plot. In italics even! Back in the early halycon days of Hyperdrive travel, many ships were lost in the Hyperspace continuum. Due to it's time and space warping capabilities, the Continuum was a simply an unknown; an uncaring place that was used as the transition from point A to point B in the blink of an eye. None really knew what it was, or cared, just as long as it got them to their final destination. The tech required to truly traverse the Continuum was hardly up to the challenge, and for some captains it was merely luck that jumped them through. Many early Hyperdrive-class ships were lost in the continuum; they never appeared at point B. In a blink of an eye, crews and well-to-do passengers with a sense of exploration to the New Worlds just simply...vanished. It was the crew of these ships that had given the Continuum it's legendary name, the Dark Sky. It was said to be a dark place, simply a void, with no existance if you became trapped there. Or so it was described by those crew members "who knew of a crewmember who knew of a crewmember" who described the experience of escaping it. Granted, there were no known published reports of anyone lost in the Dark Sky returning; but they made for good stories back then. Whew, that's a lot of italics! So I'm spending my lunchtimes at work (the only free time I currently have for board games) building my latest version of Isla Margarita piece by piece (thankfully there's not a lot there) and trying to get motivated on building Restless. As mentioned before, Restless sort of sits in a weird void between a board game, interactive fiction, and a choose your own adventure book. I'm pretty interested in working on this because it has a lot of mechanics that I want to screw around with to see if I can come up with something cool. **It has a "mechanical" paper slider and sleeve for hiding information, which I think is sort of a lost art for game information. **It can be played solitaire, or with multiple payers. **It has some amount of replay value, to a certain extent. **Assuming I have a relatively decent amount of writing capabilities (which I probably don't), it could be a fun little atmospheric piece. Of course, the drawbacks are that it's probably not much fun for those who expect a "game" in a true sense of the word. Winning is defined by trying to understand the whole story of all the hauntings that are going on, as opposed to beating the game, or collecting the most Victory Points, or whatever. And, as stated above, I'm not sure if my writing standards are up to snuff for the full effect. Plus the fact that building the book of events that happen through the night is going to be a long process. And it's pretty much un-testable by me since I know the story. So then, for some reason, a lot of elements gelled yesterday for another game idea, which I've named Dark Sky Salvage. It's got a neat little mechanic that I've been wanting to play with from my half-baked Jump Ships concept, and a fairly unique theme I've been thinking about off and on for maybe 6 years as a "wouldn't it be cool if they made a movie of this" kind of thing. Things just sort of fell into place with all these various little mechanics I've been wanting to play with. So now, I'm back to spinning plates again for my time. Or I'll just drop the Restless plate again. As is usual. Or maybe strive for 5 hour lunch breaks. As usual, I entered the latest about.com game design contest a few months ago. What's nice about the contest is that it has a pleasant restriction of using only common "found around the house" items as game pieces. And usual, I entered a game with no playtesting. Not that this seems to be a bad thing, as I managed to be a finalist a few years ago with another un-tested game. A few things have started to invade my net time. One, I was playing a lot of Wallenstein SBW-style . And two, I've been reading a lot of blogs dealing with wargames. Additionally, there is a small Holy Grail of trying to find an Advanced Civ game that can be played in a reasonable amount of time, so I've always wanted to try and conquer that molehill. So, I thought I try and put all these apples into a barrel and create a war/civ game. In under 1,000 words. And Cradle was born. The choice of name was primarily used to keep the word count down as low as possible. The game as written for the contest probably doesn't fit the true Civ-game mold. One of the things that defines a good Civ game from what I've been able to discern is the ability to trade. With 1,000 words, I've had to cut that functionality out completely. I'm not convinced that the whole multiple board thing works for paying for your new units. If I go back and re-work the rules better to playtest, I think I would just simply mark each square with a number, and let players write down on a pad of paper their unit purchases and where they go. Otherwise, I think that the game has a pretty strong foundation. And I think there's a lot I could add to it to give it a lot more flavor; such as new city power-up abilities, and global card effects, trading, etc. A checkerboard. This is the Main Map. 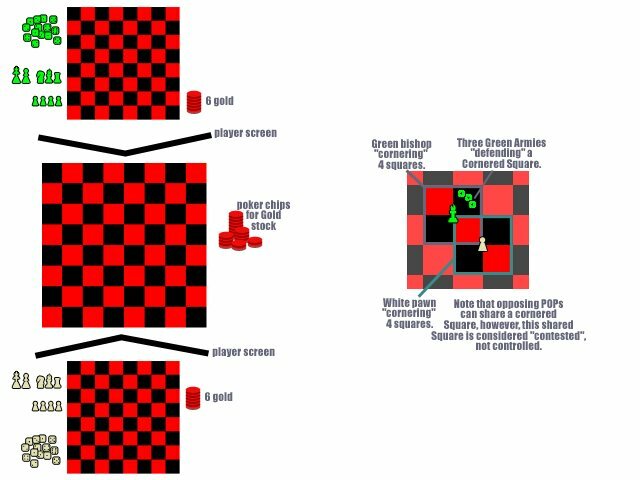 1 personal checkerboard (for simultaneously buying new items to populate the Main Map). Many 1d6 of their color (Armies). 1 half-set of chess pieces (4 pawns, 1 each of rook, knight, bishop, king, queen) in their color. These will be used as Population Centers, known as POPs. POPs score points and offer special powers to their owner. ....is the player who has the most points generated from POPs that they control. One player takes 5 Armies of each color and places them on the Map, one Army per square, anywhere he chooses. The other player chooses who plays what color. The game then begins. POPs exist on a corner of four Squares. In the rules, the terms "cornering" or "cornered" refers to the relationship of the POPs and the Squares that they connect to by existing on their corners. A Square on the Map that a Player has an Army on or is cornered by a POP is said to be "controlled" by that player. -- 1 Gold, place a new Army on a Square controlled by an Army or POP (on the Map) of your color. -- 4 Gold, place a Village (Pawn) on the corner of four Squares. None of the four squares can be currently controlled on the Map by an opponent's Army or POP. -- 4 Gold, upgrade a Village to a Town (Rook, Knight, Bishop), by placing a Town on the same corner as a Village on the Map. -- 6 Gold, upgrade a Town to a City (Queen, King), by placing the City on the same corner as a Town on the Map. -- 2 Gold, update a POP to a different type within it's class (Town or City). Players may buy as much as they wish, provided they have the Gold. Spent Gold returns to common stock. Both players move their Armies from their personal boards to the appropriate Squares on the Map, rotating ALL Armies to show 1 pip on top. New and upgraded/updated POPs are placed on the appropriate corners; removed POPs are returned to the player's stock. If both players place a Village at the same corner, the player with the most Armies cornering the corner places the Village, the other does not. Otherwise, both players return their Village to their stock. Armies showing 1 pip on top can move one Square horizontally or vertically. After moving an Army, rotate the die to show the 6 pip, indicating it has moved this round. Players can elect to move multiple Armies on a given turn. Once a player has decided to move no Armies, the Move phase ends when the other player finishes all of his desired moves. If the amount of Armies for both sides are equal, roll again as above. The player with the most Armies wins the Square, and places his Armies back on the Square, subtracting the amount of losing Armies. Highest 2d6 goes first. Players take turns selecting any POP. If there are Armies of both players on the squares that corner the chosen POP, remove the Armies which have the lesser amount. The owner of the remaining Armies owns the POP. If the POP has a new owner, this POP is replace with a Village (Pawn) with the color of the new owner. If the new owner has no Pawns left, the POP is simply removed. If the amount of Armies is equal, none are removed. This POP will be considered "contested" until resolved on a later round/turn. Contested POPs do not offer points at the end of the game, or any special powers that they grant. For every Black Square a player controls by an Army, the player collects 1 Gold. Roll 2d6. If the results show doubles, each Red Square a player controls by an Army produces food equal to the pip count on one die. Highest 2d6 goes first. Players must remove Armies from the Map until their amount of Armies is equal to or less than the total amount of food they can produce. Keep track of how many rounds are completed. After 6 rounds, roll two dice. If the number of rounds played is GREATER THAN the total of the dice, the game is over. Otherwise, start a new round. Each POP has a point total associated with it to determine the winner. Towns and Cities grant special abilities to the player who controls them on the Map. Rook -- 1 point, Place an Army on any empty Square cornered by each Village or Town you control. 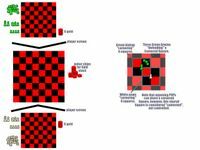 Knight -- 3 points, Armies may make an additional move after moving into a Red Square. Bishop -- 4 points, Red Squares cornered by any POP can be counted as producing food for Armies during Famine. Queen -- 5 points, All Villages and Towns are worth an Additional point. King -- 6 points, Before Famine, remove 2 Armies from the Map to gain 1 Gold.